WRENTHAM, Mass. 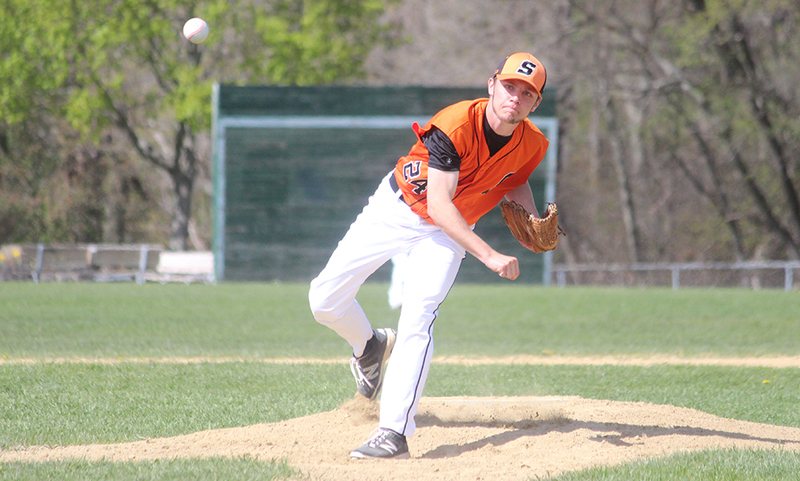 – With ten seniors on the roster, there aren’t many situations that Stoughton baseball hasn’t experienced over the past few seasons. That helps explain why there was no panic among the Black Knights heading into their last three outs, trailing KP 1-0. Stoughton plated the tying run in the top of the seventh and scored the winning-run in the top of the eighth to escape with a 2-1 win over the Warriors at newly dedicated Gary Lombard field on the campus of King Philip Regional High School. 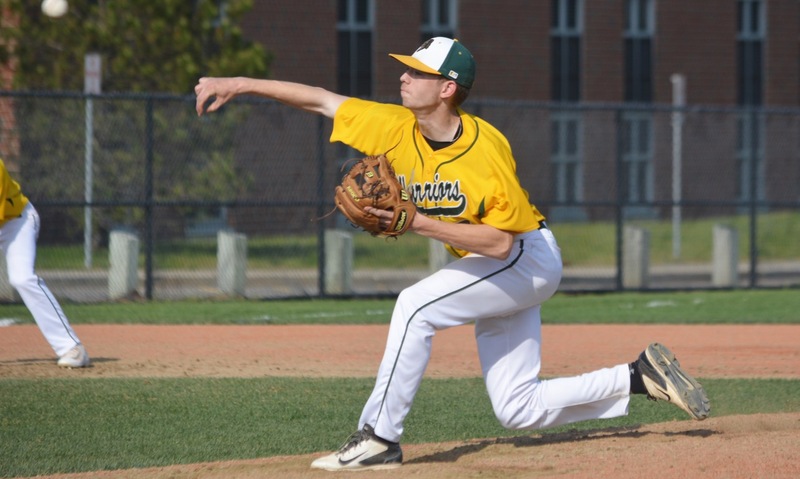 Both Stoughton senior Justin Hutchinson (compete game, six hits, two strikeouts) and King Philip senior Stephen Murray (7.2 innings, six hits, six strikeouts) dominated throughout the contest, turning a matchup between two strong offenses into a pitcher’s duel. With the Warriors holding a 1-0 lead through six innings, Stoughton senior Luke Johnson reached on an infield error to lead off the seventh. Nick Hardy came through with a sacrifice bunt to move Johnson to second and Pat Hagerty drilled a single down the right field line to bring Johnson home to tie the game. Hagerty stole second to move into scoring position but Murray picked up a strikeout and induced a fly ball to escape. Murray singled to lead off the bottom of the seventh but a pinch runner was caught in a run down between first and second after Stoughton catcher Evan Gibb quickly fired to first after a missed bunt attempt. Hutchinson sandwiched a pair of fly balls around a walk to send the game into extra innings. After a pair of groundouts for the Black Knights, senior Jack Connelly stepped to the plate. The first baseman launched a 1-2 pitch over the fence in right field — estimated at 400 feet by the grounds crew — to put Stoughton ahead 2-1. Hutchinson needed just six pitches to get three straight ground balls in the bottom of the eighth to earn the win. Both Stoughton and KP threatened in the third inning but both were denied at home on throws from the left side of the infield. In the top half, Matt Gallagher singled and Ruben Gonzalez had a bunt single to put move Gallagher all the way to third. Gonzalez stole second to put runners in scoring position with one out. Murray then got a ground ball to shortstop Will Weir, who fired home to Nolan Bradley for the tag. Murray then induced a ground ball to escape without any damage. In the bottom of the third, Jeremy Rhines led off with a second and moved to second on a sac bunt from Bradley. Rhines took third on a single from Chris Wing but was tagged out at home when a grounder went to Johnson at third and he fired home to Gibb for the tag. KP broke the scoreless tie an inning later, needing just one hit to bring in a run. Murray connected on a two-out single, moved to second on a passed ball and stole third without a throw. With Murray taking a big lead at third, Stoughton catcher Evan Gibb elected to fire down the third base line to try and pick him off after a pitch from Hutchinson. However, Gibb’s throw hit Murray in the helmet as he retreated back to third. The ball bounced into foul territory, temporarily freezing the defense. Murray took off for home and beat the throw to give the Warriors a 1-0 lead. Hutchinson allowed just one hit between the fifth and sixth innings, and the runner was erased immediately. 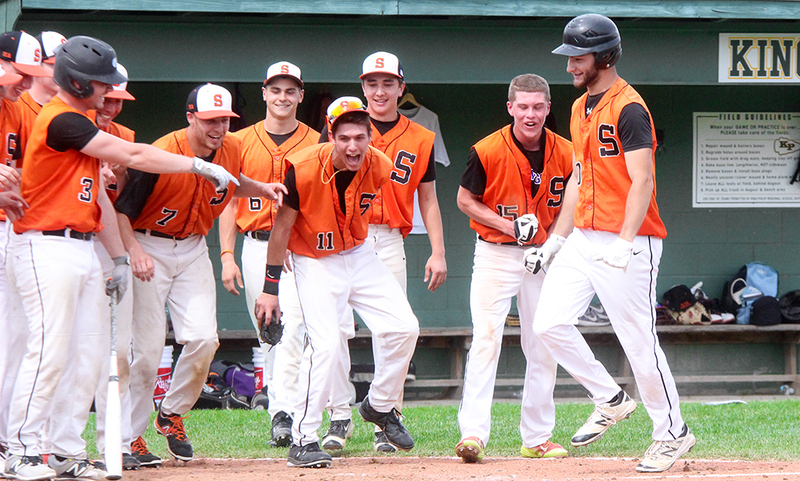 Bradley hit a fly ball down the right field line that just eluded the dive of Stoughton right fielder Ryan Sullivan. But Sullivan was quick to his feet and got the out as Bradley tried to leg out a double. Murray also allowed just one hit between the fifth and sixth innings, a two-out single from Connelly but quickly got a ground ball to get out of the inning. 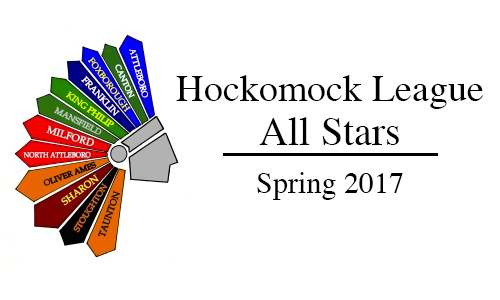 Stoughton baseball (7-2 overall, 6-2 league) is back in action on Monday night on the road at Franklin with first pitch scheduled for 7:00. King Philip (5-4, 4-4) will try to snap its current skid when it hosts Sharon on Monday at 3:45. WRENTHAM, Mass. – With King Philip leading by a run and two outs in the fourth inning, Chris Wing, who was making his first start and just second appearance of the season, walked his second North Quincy hitter of the game to load the bases. The Warriors were struggling at the plate against North Quincy starter Shawn Kelly, so KP coach Pat Weir decided it was time to go to the bullpen. He brought in senior Jake Cavanagh, who promptly induced a comebacker to end the inning and escape the jam. KP added three runs in the bottom of the fifth inning to break the game open and managed to pull out a 5-1 victory over the Red Raiders, despite managing only four hits (three of them infield hits) and hitting two balls out of the infield. “Absolutely a day to put behind us,” said Weir. “That’s the funny thing about the game of baseball, you’re always going to have one of these days. I’m actually proud of the way they were able to battle through and fight through it and still come away with the victory. What the Warriors lacked in pop at the plate they made up for with aggressiveness on the basepaths. KP finished with eight stolen bases and also advanced on four wild pitches. Although they also were thrown out trying to take second on a ball four that went to the backstop and trying to come home on contact against a drawn in infield, Weir will play the percentages and stick with the aggression. “A lot of times we’re going to make those outs at home or at second base but that’s just the way we play,” he explained. “A lot of times you apply the pressure to the defense and a lot of time you have them make mistakes. The Warriors took the lead in the bottom of the second. Jack DiCenso led-off the inning with a walk, one of six free passes issued by Kelly, and Jake Lannigan was hit by a pitch. A wild pitch moved both into scoring position for Ryan Guennette, who line a single to left scoring one. Guennette stole second and Wing was also hit by a pitch to load the bases. Lead-off hitter Stephan MacMeans grounded into a fielder’s choice that scored Lannigan with the second run. Wing cruised through the first two innings with four groundouts and a strikeout in the first six hitters. In the third he allowed a pair of singles, but a 6-4-3 double play (Will Weir to Guennette to DiCenso) ended the inning. In the fourth, North Quincy out together a rally. A one-out walk got it started, followed by a double to left that put two in scoring position. Matt McDonald grounded to third and Lannigan tried to get the lead runner at the plate but Nolan Bradley’s tag was not in time and the Raiders were on the board. Wing struck out the next hitter for the second out, but then walked Tommy Kelly to load the bases and the coach called for Cavanagh. The Warriors were still scuffling at the plate, but in the fifth they put the game away. Ryan Coulter started the inning with a swinging bunt that he beat out for an infield hit, one of two for him in the game. Cavanagh drew a walk and both moved up on MacMeans’ two-strike sacrifice bunt. Kyle Guenthner grounded to third and the throw to the plate was judged to have beaten Coulter, although it did not appear that the catcher had actually made the tag. Kelly threw a wild pitch and that brought Cavanagh home and Guenthner stole third. Will Weir walked and managed to get himself into a rundown that allowed Guenthner to score before diving back into first safely. Weir then stole second and third. He would score on another wild pitch to make it 5-1. Three runs for the Warriors with only one hit that did not get past the mound. Cavanagh shut down North Quincy. He threw 3-1/3 innings of one-hit relief and struck out two in each of the final two innings. KP (12-1, 10-1) will be right back on the diamond on Friday with a non-league game at Sharon.